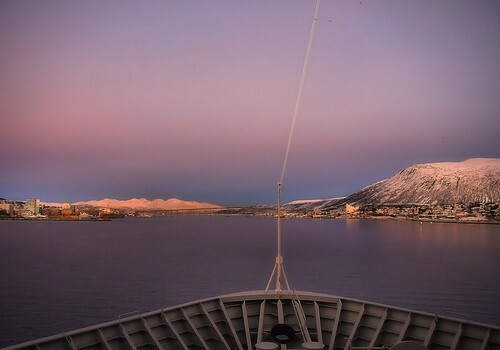 The largest town in Norway Arctic is coming up in front of the ship as we, in the artic afternoon light, sails towards the harbour which will be at the left side of the bridge in the far distant. To the right you can see the Arctic Cathedral with the typical white walls. Tromsø city is the ninth-largest urban area in Norway by population, and the seventh largest city in Norway by population. It is the largest city and the largest urban area in Northern Norway, and the second largest city and urban area north of the Arctic Circle (following Murmansk). The city is warmer than most other places located on the same latitude, due to the warming effect of the Gulf Stream. The city centre of Tromsø contains the highest number of old wooden houses in Northern Norway, the oldest house dating from 1789. The Arctic Cathedral, a modern church from 1965, is probably the most famous landmark in Tromsø.